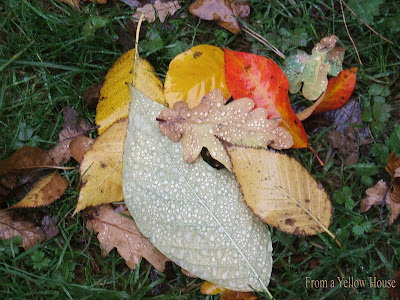 I took a lot of pictures of the leaves that were in their full glory, still attached to the various trees, but they were equally beautiful scattered across the grass. It was a misty day so there was a layer of moisture on things here and there. I love how the water droplets are decorating the underside of the big leaf in this little group.